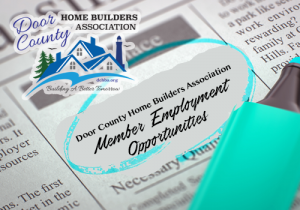 Employment opportunities available with Door County Home Builders Association members will be posted here as a service to our members. Job seekers, please contact each member directly to inquire about a job opening. DCHBA members please submit your job openings using the form here. Requirements:Applicants must have valid drivers license, be comfortable with heights, and be able to lift up to 100 pounds. We are looking for a team player who is willing to learn our quality standards for construction. Our employees must also be able to conduct themselves professionally around the homeowners and with other sub contractors. Instructions On How To Apply: Respond by phone or e-mail with intent, brief qualifications, and contact info, or send resume via e-mail or regular mail. Company: Van’s Lumber & Custom Builders Inc.
and click the Apply Now button.